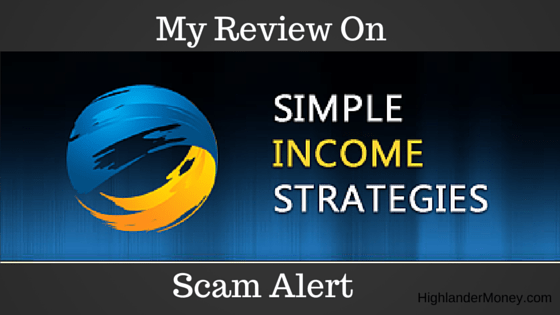 Home › Reviews › Is Simple Income Strategies A Scam? Is Simple Income Strategies a scam? Can you make money online using Simple Income Strategies? Well sometimes, to get where we want to go we have to walk or drive through unsavory neighborhoods. This is the case here, as we won’t be stopping or getting out of the car, but maybe accelerating a little to put some space between this simple internet scam and you. So what are they going to be teaching you? Teaching you how to place links on the internet. Holy Cow, for a $97.00 price tag. This is their selling tactic? From their several years of experience putting links on the internet? This is all the information I have to go on, is Simple Income Strategies word on them have years of experience placing ads. Okayyyyy…This tactic is not worth $97.00. Maybe it’s worth $1.00, I can learn this on YouTube for free. They give you very little information to go on their homepage. I realize they don’t want to give away their “secrets” for free but more information would ease a customer mind when purchasing. Transparency is not here at all, and that is a BIG concern. Step 1: Watch step-by-step training videos on placing ads and making money. With titles that they show are The Introductory Video, Where To Place Ads, Intermediate Ad Placement and Traffic Techniques, and wait for it…Big Dogs Webinar. Who the bleep is Big Dog? Step 2: Place the links to the ads. You’ll be placing advertisements for quality products and services like these. I can barely make out from their pictures Amazon, Eagles Eyes Glasses(never heard of them) Lancome, and two of them I can’t even read. More deceptiveness!? Step 3: Login and see how successful (or unsuccessful) you’ve been. Easy to use back office allows you to check your daily earnings so you can see how much money you’re making every day! Or not making. The business model is basically teaching you affiliate marketing. Which is a proven way of making money online. But they are stating that you could be up and making money fast and easy. Well, let me tell you it’s not that easy. There is so much to learn and do to be able to make money online using affiliate marketing takes time. Anytime something says it’s easy to make money, run and run fast. No Monthly Charge Ever! A one time fee of just $97.00. Claims 60 Days money back guarantee. They keep referring to the lousy economy. I think the economy has recovered. This is obviously targeting unemployed workers. Which is very deplorable and almost unforgivable. False hope with also taking their money. Somewhat misleading it states “If you can spare 60 minutes a day” at the top of the sign up page then later states in the same page, “I simply log onto the Internet, wherever I am, and do a couple of hours of easy work each day“, well, which is it. 1 or 2 hours a day. Multiple sites that are spelled differently and with different domain names, coupled that with different looking websites, gets my spidey senses tingling, with the word SCAM. Again, with the misleading advertisement, “Work From Home Opportunities Have Been Featured On Fox News, MSNBC, USA TODAY, ABC, CNN” It’s vague number one, never states Simple Income Strategies was featured just Work From Home Opportunities, huh. Scammy? YES. Very deceptive! Trying to gain your trust. Promotes it’s easy to make hundreds of dollars a day using their system and doing all of this right away. Another scammy scummy technique. This should be throwing the red flags up for you. They have a mansion, a yacht and an expensive car shown on their website to entice you into believing you will get rich. This is so amateurish and just by this alone screams SCAM to me. Check your area for availability!!! CLAIM MY SPOT NOW!! !…Again, misleading, like they are going to turn away your $97.00. It’s deceptive practices to get you clicking thru on impulse. But don’t be fooled. Run from this owners name Kelly Simmons, multiple uses of this fake name on numerous scam sites, while doing research on this company I found they placed a picture of a lady claiming to be Kelly Simmons only to later be found out that the image of the lady is taken from iStockphotos website. Taken down the owners name now, No transparency before purchase. Owners name, support, FAQ, contact page. More crimson red flags popping up. If you look at Step 1: precisely at the video thumbnails, they are date marked March 2011. OMG! So these antiquated videos from more than six years ago you want me to buy for $97.00. Even if you updated them on your site, your to lazy to put the updated information of thumbnails up. I don’t think they are updated though. In the world of internet money making techniques 6 years is centuries old. I see scam techniques and/or pure laziness, and I don’t give my money to either. They write above the picture of mansion, yacht, and car, “You can have all your life wishes if you just apply yourself to this program”. I laughed and laughed some more when I read this. Blatant selling you empty false hope. Yes, I am still laughing. Scam Tip Off – Vague, doesn’t mention Simple Income Strategies, just work from home opportunities. Who is Simple Income Strategies for? A fool and his money are soon parted. So, this system is for nobody but fools after they have read this review. An obvious scam. Keep your eyes open for this style of scam because the owner changes the name of the system but keeps the same platform of training. As an internet search revealed, this John Shaver guy owns like 72 websites. This guy is prolific with his scams. Watching four videos. This is all the information provided, so this is all that I know of, maybe they have more, but I am not buying their system to support them just to find out. More Deceptive Practices from Simple Income Strategies. They claim to give unlimited personal support along with the access to the VIP members area. What in God’s name is that? No explanation. They proudly state a one-time investment of only $97.00. A hundred bucks basically. With no monthly charge ever! Total B.S. Another Example of selling empty hopes. Is Simple Income Strategies a scam. Yes. Total scam. Complete waste of time and money. Stay away far away. Although they try to come off like a legitimate company that promotes affiliate marketing techniques they promise way too much, to fast with old information and without a continuing support system to help with problem spots. This is the bottom of the barrel as far as I am concerned. If you are looking for a legitimate program that will make you money with up-to-date training, transparency, a large and helpful community, multiple forms of support and access to the owners that don’t promote getting rich fast and easy. This is a great program, and I am a current member and will be for years to come. I would recommend you read my review of Wealthy Affiliate Review 2017. If you are looking for 100% legit way to make money, by owning your own online business. Take the next step to financial freedom. It provides the best training online along with the most helpful and friendly community online, with all the needed support to get you building your online business. Completely scam free. I recommends you read my #1 Recommended Program and sign up to get started today. If you have experience with this company or have a comment or questions, please do so below. As I would love to hear from you. Thanks. ‹ Is Forum Coin Legit? It appears to be a very honest and no holes barred review and when I glanced at it before I actually read it I knew I was onto a great read as there were far more negatives than there were positive. Just to let you know that I have never heard of this “company” before but thanks for the heads up because if I do I shall be much more informed about them/it! Hey Simon, thanks for the kind words. Many people never heard of these Names of companies that scam, but it’s good to see what tactics they use to lure potential prey. Then you can make a more informed decision when the opportunity arrives. This company uses several deceptive techniques, from which to learn from. Glad I could potentially help you. There is a problem that people don’t want to take the time to read the truth, they want glamourous start off, teachings like this I think will reduce scams online to a certain percentage. There is so much to learn in affiliate marketing to be able to earn,people should not think of easy money making. It always ends up into a scam. It is so often the case, as with me too, that were willing to believe sometimes that’s quick & easy rather than making headway slowly. I am thankful everyday too about finding Wealthy Affiliate. It’s help me grow my business and grow personally too. I can’t say enough good things about it, but it also takes some time to get going initially. Dan – do you have any idea how to contact SIS? All the emails come back and the Telephone number I have is someone else. I already alerted my CC Company and the charges haven’t posted yet but they are out there. I should have known better. I belonged to Wealthy Affiliate and left because of the monthly fee. 🙁 I really did learn a lot though. Hey Carol, Sorry for your experience but I don’t have a working telephone number or email. Don’t beat yourself up over this either, we all at one time or another fall into to these kinds of trap. I hope you get things resolved. I am still a premium member at Wealthy Affiliate, as I also still have a lot to learn it’s also nice networking there too. Hope to see you come back sometime, get a hold of me if you do. Why should we believe you? Your promoting a diferent scam website. Shame on you. Your all pathetic all of you. Get a job . Earn an honest living. Because I researched it. I do not promote scam websites. Wealthy Affiliate is not a scam, you have to work hard and commit a lot of time and energy. It is not a scam. How do I know because I am a current member that’s why, and it’s methods work. I also have a full time job on top of the other websites I own and maintain. I do make a honest living, and I work hard at everything I do. I have worked hard all my life, but now I work a little less hard because of WA. I have worked two jobs for many many years. Your snap judgements fall short. I put my money where I put my words at. Do YOU? I see you left the website as Simple Income Strategies, are you a member or owner? I am simply alerting people of fraud companies and legit companies. Simple Income Strategies is not legit, it is a scam in every sense of the word. Shame on you for misleading people to an obvious scam. Scams promise big, deliver nothing. Wealthy Affiliate promises nothing delivers big. Huh.